SVHS or Super VHS is a VHS format, introduced by JVC in 1986, that enables recording and playback of very high resolution video. The format uses a 4 pin din cable to carry the separated signals, chrominance and luminance, versus the composite type that combines the signal over one wire, thus avoiding the color encoding process and its inevitable loss of picture quality. SVHS requires special equipment to play. 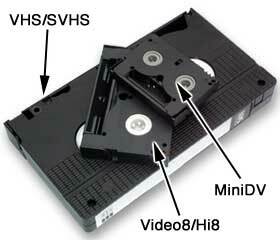 SVHS video tapes carry 400 lines of horizontal resolution. Super VHS was originally designed for the prosumer who needed to edit from their original tapes without the quality loss associated with VHS. SVHS makes a good master because dupes from them look as good as a VHS original, however they do require special equipment to view, and they are analog, so some signal loss is inevitable in the dubbing process. Received the DVD and films late yesterday. Dave and I watched it this a.m. THEY ARE WONDERFUL! We are sending eleven more reels via UPS today. .......thank you, thank you, thank you!